This post was going to be an update of the SMS using Twilio Rest API in ASP.NET Core post a made a year or so ago, but once I got the example project created I noticed that the default template has removed SMS as an option for two-factor authentication in favor of authenticator auth support. 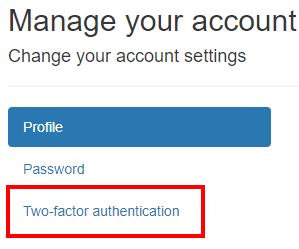 This post is going to explore the setup of this new two-factor authentication style. In a follow-up post, I may look at adding back support for SMS as the second factor as that seems like a more common scenario albeit a less secure one. To create a new Razor Pages application using individual authentication I used the following command from a command prompt. Make sure you are in the directory you want the files to end up. The only reason I mention this is I just spend the last 5 minutes cleaning up my user directory because I forgot to change directories. Next, I move up a directory and used the following command to add a new solution file. Finally, I used the following command to add the new project to the solution file. If you aren’t using Visual Studio then you don’t have to have the solution file. The project after the above can be found here. Strictly speaking, a QR code isn’t required, but it is much better for users so they don’t have to enter a 32 character key into their authenticator application manually. I followed the official docs to enable QR code generation. Next, find your project’s EnableAuthenticator.cshtml file and update the scripts section at the bottom of the page to the following. The above changes are all that is required, and now we are going to walk through what it looks like for the user. Once logged in click on your user in in the upper right after of the site to open user management. Next, click the Two-factor authentication link. 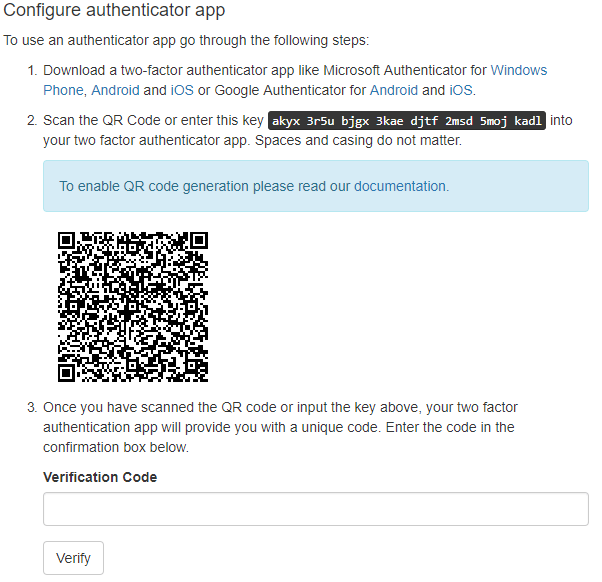 Then, click Configure authenticator app link. This will land you on the page with the QR code. Now using the authenticator application of your choice you can scan the QR code. Once scanned your authenticator application will display a code. Enter the code in the Verification Code box and click Verify. If all goes well you will be taken to a page that lists a set of recovery code for use if you can’t use your authenticator application for some reason. I think it is awesome how easy the ASP.NET Core team has made the use two-factor authentication. With this being built into the templates it pushes all in the right direction. I do wish they would have left SMS as an option, but hopefully, it wouldn’t be hard to put back in. The code in the final state can be found here. Version 2.1 of Identity Server 4 was released a few weeks and this post is going to cover updating my sample project to the latest version. The starting point of the code can be found here. We are going to tackle this in sections as there are updates needed for an ASP.NET Core Update, Identity Server Update, and some broken bits in Angular. The sample projects were all on ASP.NET Core version 2.0.0. For each project right-click and select Edit ProjectName.csproj. Make the following change. Right-click the Identity App project and select Edit IdentityApp.csproj. Next, make the following changes. Next, need to add a couple of Entity Framework migrations to see if there were any data changes with the following commands from a command prompt in the Identity App project directory. Turns out that there were no data changes for this version so if you are on version 2.0.0 you can skip this step. I’m not sure how I didn’t hit this issue on the last update post, but the Client App needs to be changed to use the new Angular HttpClient. I got the following error when trying to run the client application. NodeInvocationException: No provider for PlatformRef! Error: No provider for PlatformRef! After some digging, I tracked the issue down to using HttpModule instead of HttpClientModule. To make this transition we need to make a few changes. In the app.module.shared.ts make the following changes to the imports section. Next, in the imports array make the following change. Next, in the webpack.config.vendor.js fille add the following to the vendor array. The last changes are to the auth.service.ts and they are extensive so instead of going through them I’m just going to post the full class after all the changes. With all those changes made run the following two commands in a command prompt in the Client App project directory. This post ended up being more about Angular than Identity Server, but it is nice to have everything upgraded to the latest and working. The files in the completed can be found here. This post is a continuation of my exploration of using Auth0 with ASP.NET Core with an API and an Angular front end. I recommend you start with the first post if you are new to Auth0. 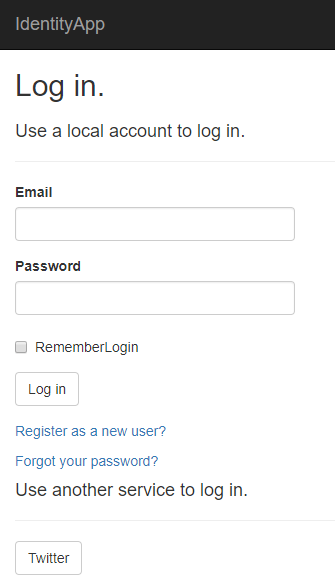 This post is going to add a login from Angular in the Client Application as well as accessing the API once logged in. The starting point of the code can be found here. To give us an endpoint in the API to call let’s move the SimpleDataController class from the ClientApp/Controllers directory to ApiApp/Controllers directory. Also, remember to adjust the namespace to reflect this move. To remove some complication we are going to add a CORS policy to the API Application to allow all CORS request. This wouldn’t necessarily something I would recommend for a production application. For more information on CORS check out this post. 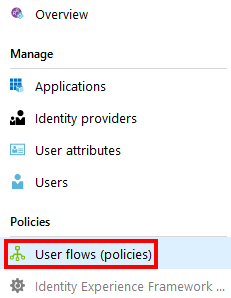 To add the CORS policy open the Startup class and add the following to the ConfigureServices function which adds a CORS policy to DI that allows all calls through. Next, in the Configure function, CORS needs to be added to the HTTP pipeline with the policy added above. The following is the full function body for reference, but only the CORS line is new. Note that the API isn’t currently using Authorization at all and won’t be for this post. Instead of redoing a lot of the same work that I covered in some of my posts on using Identity Server and Angular together I decided to copy the ClientApp directory and use it as a starting point. 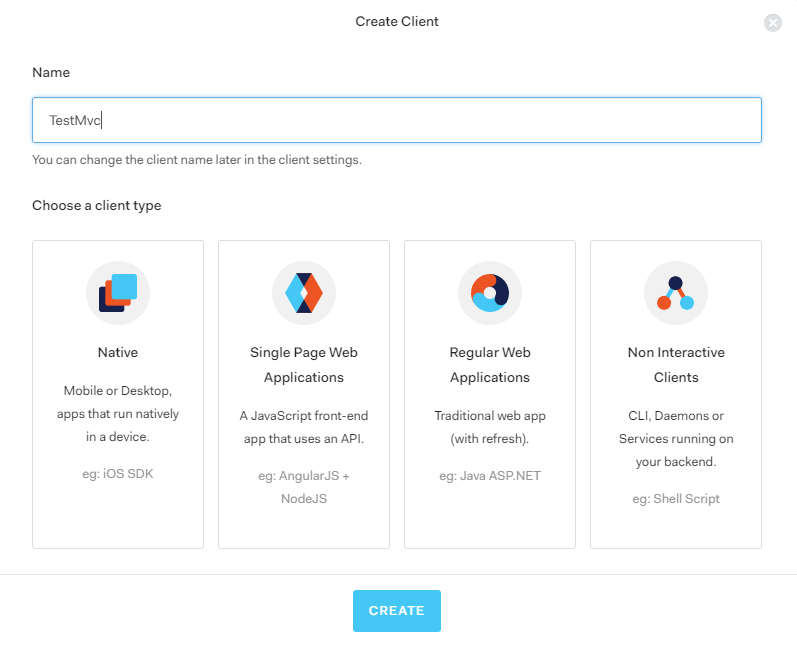 The rest of the client changes are going to assume the same starting point which means we will be using angular-auth-oidc-client instead of the Auth0 client to do the Open ID Connect bits. We need some setting from the ASP.NET Core part of the client application. First, add the following new settings to the appsettings.json file. Next, Index.cshtml needs to be changed to provide some prerender data. The following shows the new data being passed into the Angular application (this post covers this in detail). Now that the prerender values are being passed in we need to handle them in the boot.server.ts file in the createServerRenderer export. The following is the full list of values. Down a bit in the file, the setImmediate call needs to be changed to the following. Next, in the app.module.browser.ts file we need functions for getting the config values as well as the associated providers. The following is the full file without the imports. 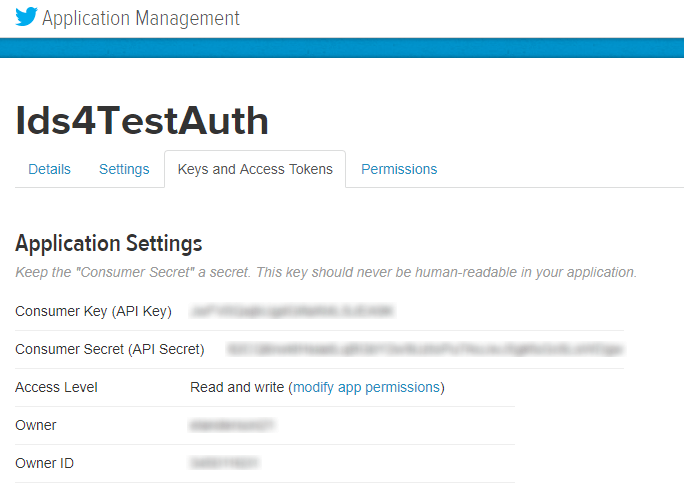 Finally, in the auth.service.ts file we need to inject the new configuration values. The following is the constructor that takes in the new values as well as uses them in the set up of the OpenIDImplicitFlowConfiguration. Make sure in the Auth0 client setup you allow the callback listed above or you will run into issues. Working on this post further convinced me that Open ID Connect is the way to go. I basically took an implementation that was meant for Identity Server and used it with Auth0. Make note that the reason the API is unsecured at this point is that I had an issue getting angular-auth-oidc-client to play nicely with Auth0 for some reason. I doubt it is an issue with either product just some sort of missing configuration on my part. This is the part of the post that I sunk so much time on. In the end, I decided to just skip it for now. If anyone does get that setup work I would love to see the sample so I know what I was doing wrong. As I started my exploration of Identity Server I listed a few alternatives that provided the same type of functionality, but as a Software as a Service. This series of posts will be covering one of the options I mentioned, Auth0. The big selling points for Auth0, and other services like it, are that it removes you from having to worry about Auth/User Management and get to the part of your applications that bring value to your customers. As with Identity Server, Auth0 can use OpenID Connect (as well as a lot of other protocols), single sign-on and API Access Control. The first step in getting started is to sign up for a new account. Here is a link to the sign-up page (not an affiliate link). You can use a username and password or a social login. I’m going the social route using GitHub. After user creation then there are a couple of setup steps. The first is to choose a tenant domain and region. Click next and on the second step, there are questions about what the account is going to be used for. In my case, it is a personal, developer, who is just playing around. 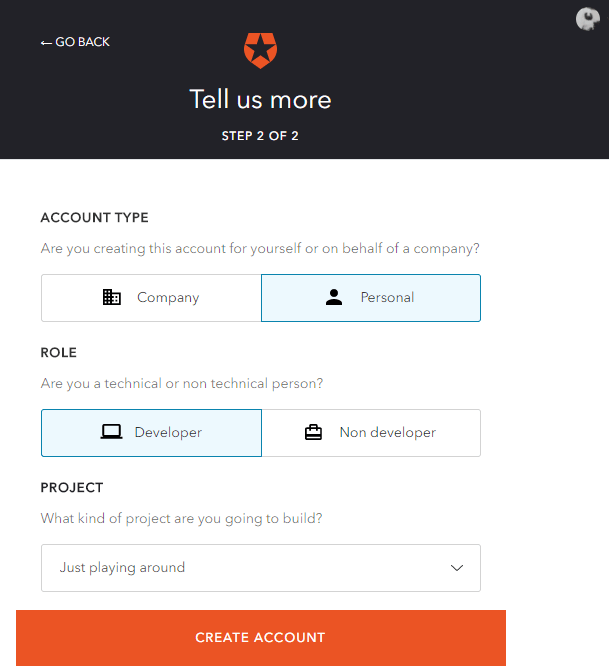 Click Create Account to finish the creation of your account which will then land you on the account dashboard page. From the Auth0 Dashboard click the New Client button. 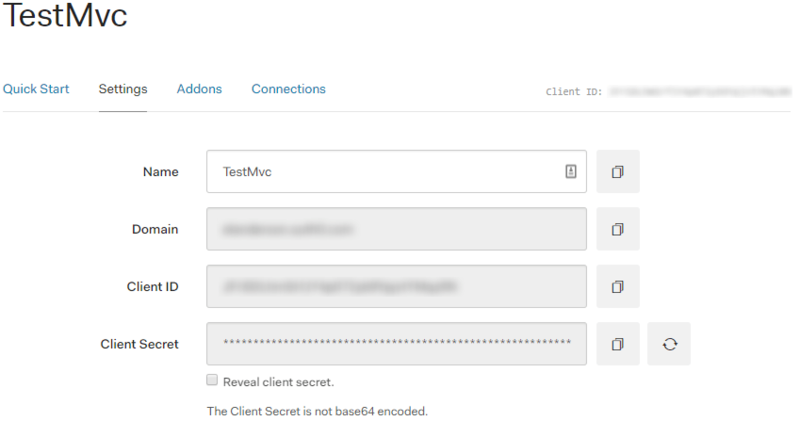 Give the client a name, TestMvc in my case, and select Regular Web Applications as the type. In a follow-up post I will be covering the Single Page Web Application, but for this post, we are going to be using MVC since it tends to be simpler. The next page defaults to a framework selection which seems to be a guide to getting going for the framework you select. We are going to skip that and click on the Settings tab. On the settings page, we need to fill in a value for Allowed Callback URLs. The sample client should use http://localhost:50774/signin-auth0. Click the Save Changes button. While we are doing some setup on the Auth0 site we are going to go ahead and set up our API as well. Click the APIs menu option on the left menu. Then click the Create API button. In the dialog enter a Name and Identifier and click the Create button. The sample solution for this post has two projects. ApiApp – Backend application and is a resource that is will require authorization to access. The API is an ASP.NET Core Web API. ClientApp – Frontend application that will be requesting authorization. This is an ASP.NET Core application that is hosting an Angular (4) application. Note for this post we will be using MVC and not Angular. A future post will deal with the Angular side. The sample solution with the two projects already added can be found here. If you are using the sample solution feel free to skip the next two sub-sections as they are going over how the projects were created. To start, add a directory to contain the solution. Inside the solution directory, create an ApiApp directory. 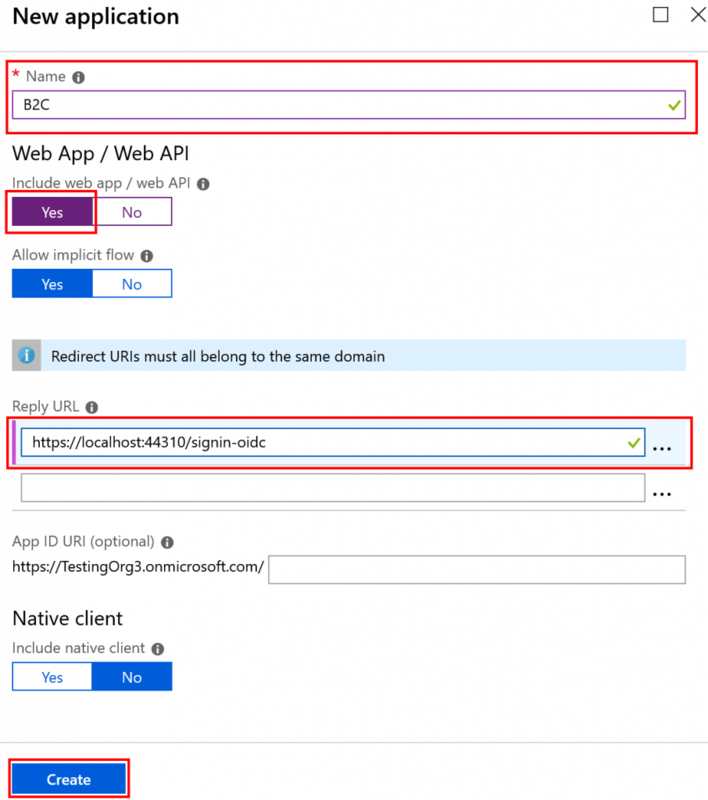 From the command line in the ApiApp directory run the following command to create a new ASP.NET Core application using the Web API template. Inside the solution directory, create a ClientApp directory. From the command line in the ClientApp directory run the following command to create a new ASP.NET Core application using the Angular template which as of this writing outputs an Angular 4 application. After generation is done run the following to make the all the NPM packages that are required get installed. Inside the solution directory, let’s create a solution file for use with Visual Studio. 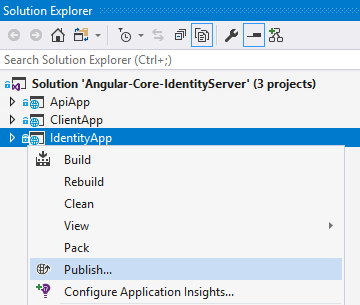 Run the following command to create a solution file named AspNetCoreAngularAuth0.sln. Next, run the following two commands to add the API and Client projects to the solution. Open the appsettings.json file and add a section for Auth0. 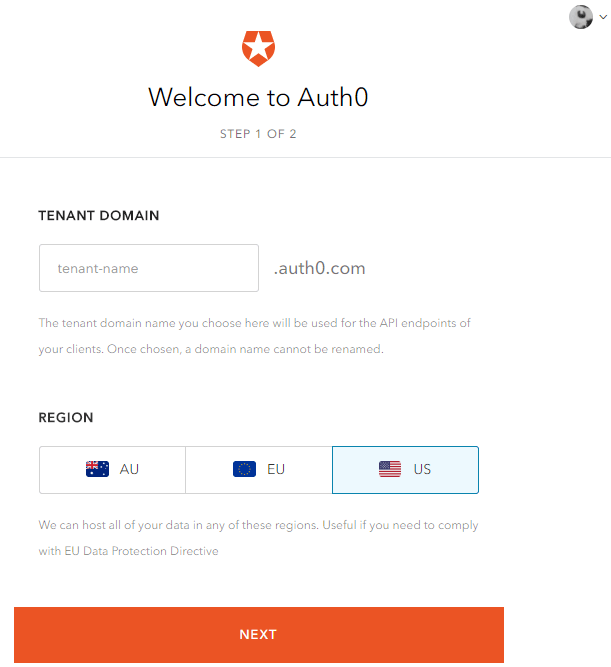 We are going to need to store the Auth0 domain (tenant domain from sign up) and API Identifier (from the creation of the API at Auth0). 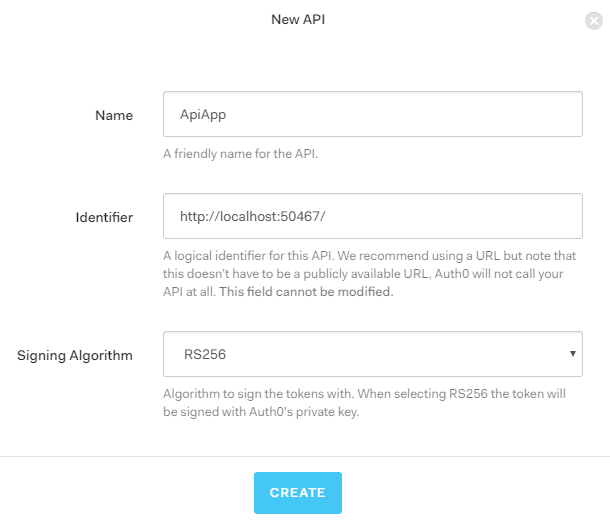 The following is the full file from the API project with the new Auth0 section. Next, in the ConfigureServices function of the Startup class add the following to add authentication using the JWT Bearer scheme to the DI system. In the Configure function add the following line before app.UseMvc() to add authentication to the HTTP pipeline for the API application. The last step in the API for this post is to add a controller that will require authentication. The following is the full code for the AuthTestController that was added to the Controllers directory. In the Client Application open the appsettings.json and add the following setting related to Auth0. This is the full file so the logging section was existing. If you are going to be checking in your code into a publically accessible source control I recommend you use user secrets instead of appsettings.json. You can read more about user secrets here. Next, in the ConfigureServices function of the Startup class add the following. I’m not going to go over this code line by line the gist is it is setting up the application to using cookies and Open ID Connect for authentication. Note that the OnRedirectToIdentityProvider bit is related to getting access to the API. In the Configure function add the following line before app.UseMvc to add authentication to the HTTP pipeline. In order to provide a way to test login, logout, and API access without using the Angular portion of the client app, remember that will be a future post, I add an AuthTestController to the Controllers directory with the following. Sorry for the formatting, but that sample has long of verbose statements. Nothing crazy going on in this file. There is an Index action that attempts to call the API and then returns a view. 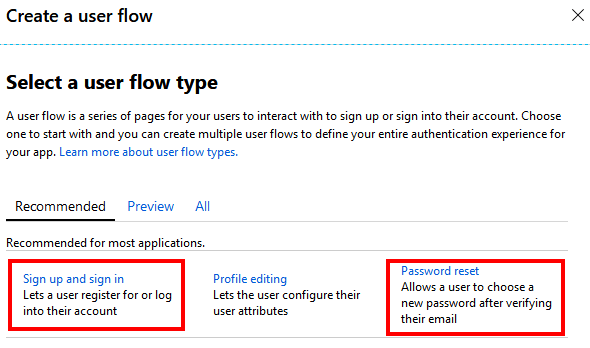 The Login and Logout functions do what they say and were pull right from the official docs. The associated Index.cshtml file was added to the Views/AuthTest directory with the following. This view just shows a link to login or logout and shows the results of the API call. It is ugly but is enough to prove the setup is working. Getting up and running was much fast with Auth0 and would be true of any SASS option I’m sure. It also helped that I have more of an idea of what is going on after all the posts I did on Identity Server. Another positive is Auth0 has some great docs. I used the ASP.NET Core and Web API ones a lot to get this sample application up and running. Next steps are to get this setup running in the Angular client which should be my next post. The finished code for this post can be found here. 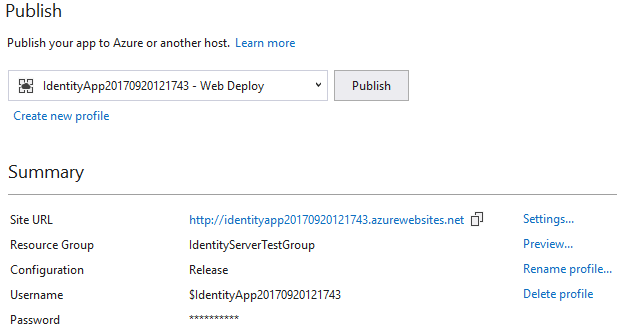 This post is going to cover taking the existing set of applications we have been using to learn about Identity Server and deploying them to Azure. The starting point of the code can be found here. 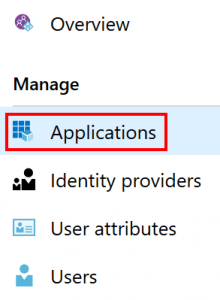 The applications as they stand from the link above are not ready to be pushed to Azure most due to some configuration changes that are needed. We will go through each of the applications and take the hard-coded values and move them to appsettings.json. The API application needs two configuration values for the address of the Identity Application and the address of the Client Application. The following two lines need to be added to the application’s appsettings.json file. Then in the Startup class, the values need to be used. The Identity Server address is used in the JWT Bearer setup. Then the Client address is used in the CORS setup. The Identity application needs a configuration value for the address of the address of the Client Application. The following line needs to be added to the application’s appsettings.json file. Next, the Config class needs a reference to configuration passed into the GetClients function. Next, the references to http://localhost:5002 need to be replaced with the value from the configuration. The following is one example. 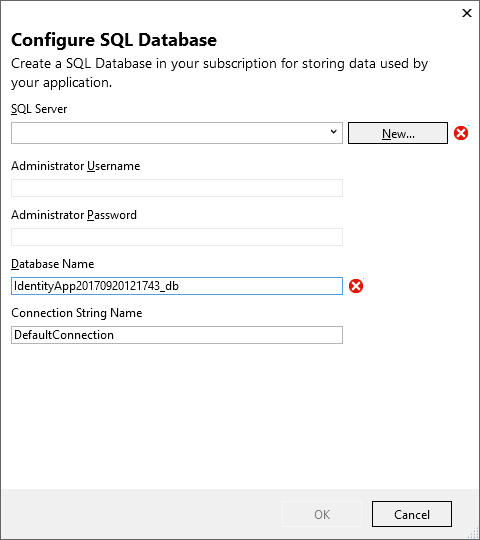 As part of publishing this set of applications, this example is going to use Azure SQL and right now the application is set up to use SQLite. 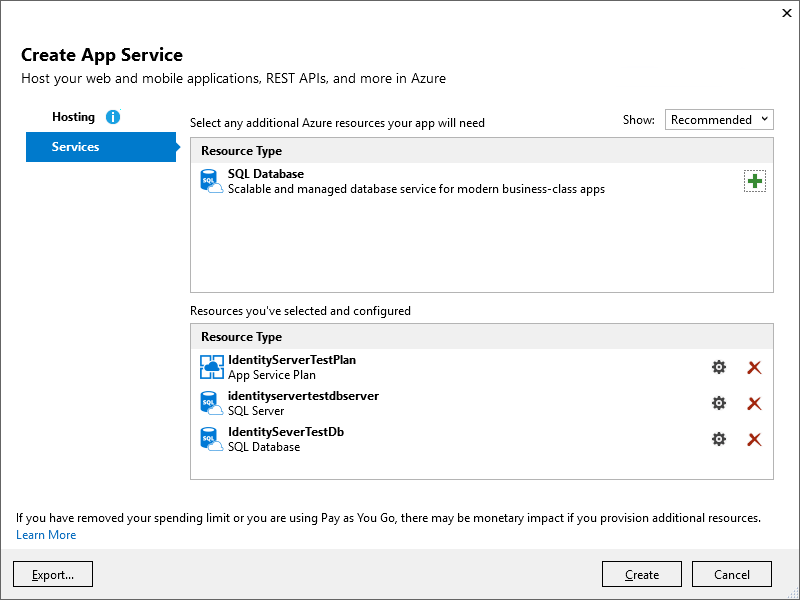 In the Startup class replace UseSqlite with UseSqlServer. The following is an example of one of the needed replacements. When switching database providers make sure to delete and recreate your database migrations. I didn’t to begin with and it cost me a lot of time in changing down a strange error which this post covers. The Client application needs two configuration values for the address of the Identity Application and the address of the API Application. The following two lines need to be added to the application’s appsettings.json file. 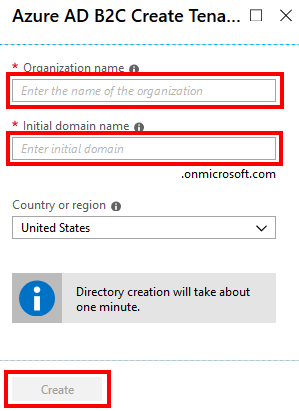 Then in the Startup class, the Identity Server Address needs to be used in the AddOpenIdConnect call. Next, the configuration values need to be passed to the Angular application. This process ended up being harder to figure out that I had anticipated and turned into a full blog post on its own. See this post for the details. The code for all the changes will also be on GitHub in case you need to the the diff for the client application. Right-click on the Identity Application and select Publish. 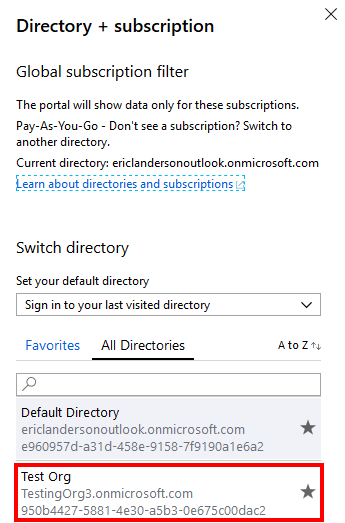 This will show the Publish screen which provides the option to publish to Azure. We don’t have an existing App Service so we are going to create a new one. This page in the official docs explains all the options available on the publish screen. Click the publish button to continue. The next screen that shows is the Create App Service Screen. I used all the default values and created a new Resource Group and App Service Plan. Keep in mind that the resource group and plan will be reused for the remaining two applications we are looking deploy. The only thing that will change between the applications on this screen will be the App Name. The services tab looks like the following. Next in the additional resources box lets hit the plus button next to SQL Database since our group of applications is going to need somewhere to store data. This will take us to the Configure SQL Database screen. Since I don’t already have a SQL Server setup I am going to hit the New button to add one. That results in the next screen where you enter a name for the server as well as a username and password. After entering the required information click OK. 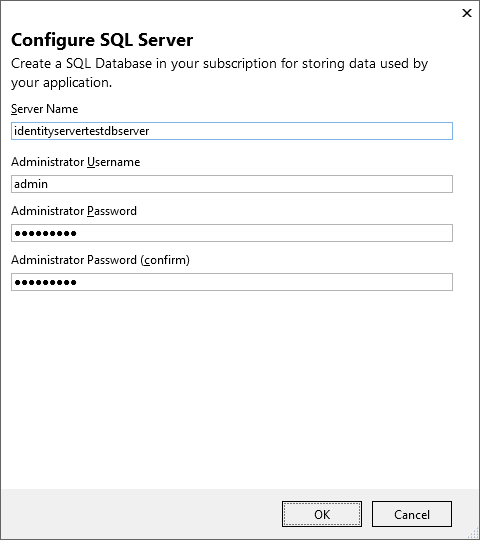 This will put you back on the configure database screen with most of it filled out. Make sure to set the database name you want to use. Finally back on the Create App Service screen, you will see all the resources that you selected and configured. When you are satisfied with what you see click the Create button and let Azure do its magic. When it is done you will see the profile now listed on the Publish page. The above needs to be repeated for both the API and Client Applications, but using the Resource Group and App Service plan created above. Each profile should use a unique application name. The Identity Application needs access to the database that we created above. This means we need to set the DefaultConnection. The first step is to determine what the connection string should be. 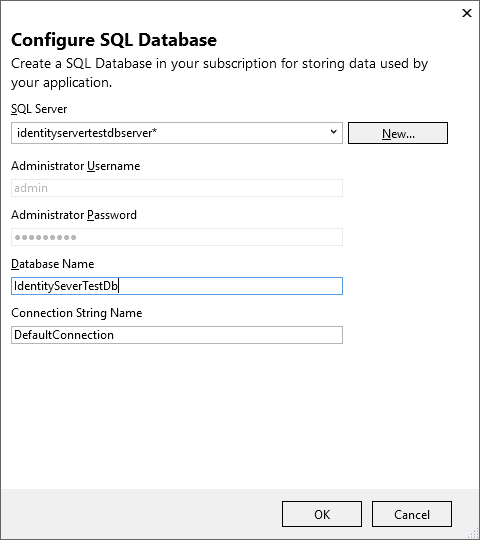 On the Azure Portal in your list of resources select the SQL database that we created above. On the next page copy the provided connection string. 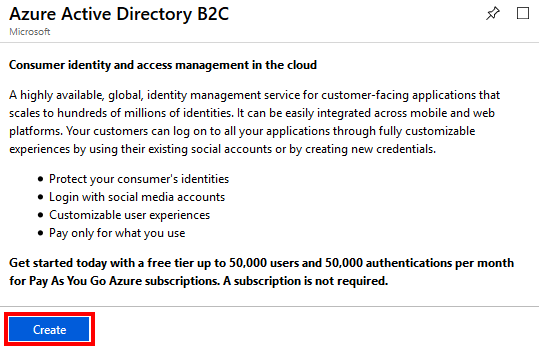 Now navigate to the Identity App Service and under the Settings section select Application settings. Scroll down and find the Connection strings section and enter the copied value as the DefaultConnection. Just above the Connection strings section we also need to enter a few values in the App settings section. For the Identity Application, we need the Twitter key and secret as well as the address of the client application. The following is a screenshot minus the actual values. For the ClientAddress use the URL found in the Overview of the Client App’s App Service page. 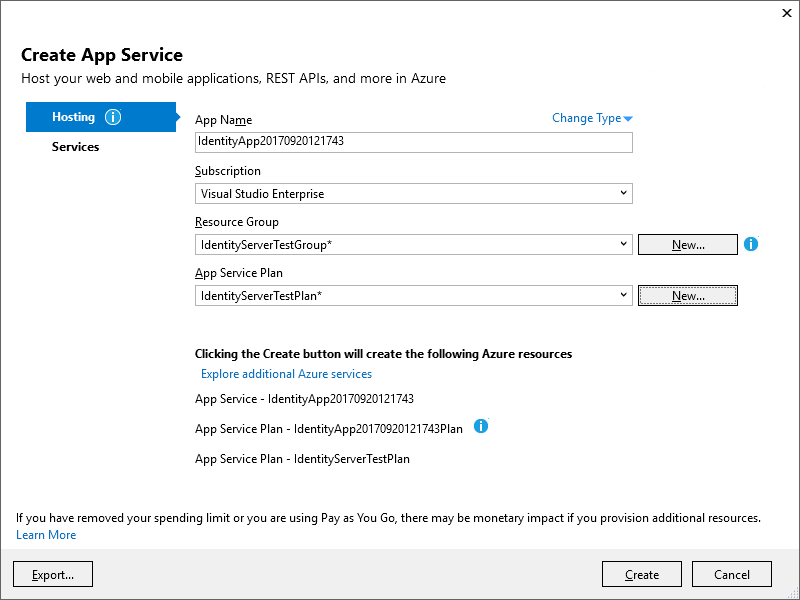 From the list of resources select the API App’s App Service page and in the Settings section select Application settings. 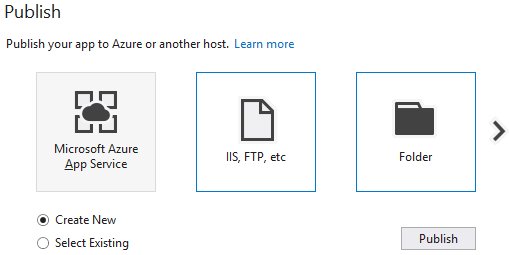 In the App settings section add values for IdentityServerAddress and ClientAddress. As with the ClientAddress above the URLs for each application can be found on their respective App Service pages. From the list of resources select the Client App’s App Service page and in the Settings section select Application settings. In the App settings section add values for IdentityServerAddress and ApiAddress. 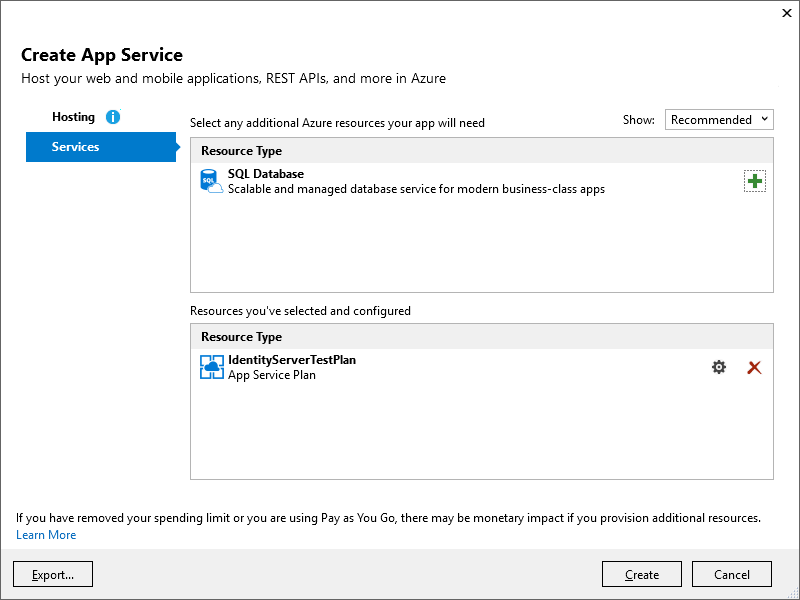 At this point, you should be able to load up the application at the client address provided by Azure and have a working application. Overall the deployment to Azure was pretty easy. Getting the applications prepared to be deployed was a bit more challenging and sent me down a couple of rabbit holes. The code in its final state can be found here. After writing the basic migration guide from ASP.NET Core 1.1.x to 2.0 I embarked on the task of upgrading the rest of the projects I have on GitHub. For the most part, it has been a pretty smooth transition. This post is going cover the differences that I hit while converting an API that is part of my IdentityServer sample project. This assumes that you have already followed my other migration post which can be found here. The source of this conversion being different is that the IdentityServer4.AccessTokenValidation NuGet package is not currently supported on ASP.NET Core 2. Token validation can be done using bits provided by the framework. This is the recommended path suggested by the IdentityServer team as posted on this issue. Longer term you may want to switch back if you have a need for more features not provided by the Microsoft implementation as pointed out in this issue. As for the actual change, just remove the reference to IdentityServer4.AccessTokenValidation from your project using the NuGet UI, Package Manager Console, or by editing the csproj file. All the rest of the changes are in the Startup class. First, in the Configure function app.UseIdentityServerAuthentication gets replaced with app.UseAuthentication. In the ConfigureServices function is now where JWT Bearer options are set up. First, we have to add the type of authentication the API is going to use and then the options for JWT Bearer are set, which will match the settings that were being used before with the IdentityServer package. 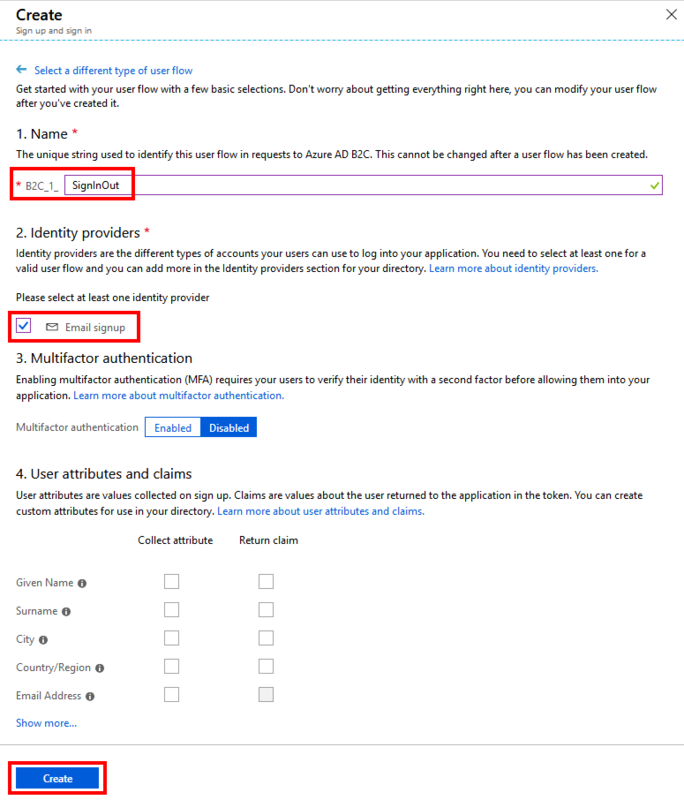 With the above, your API can run on ASP.NET Core 2 and still verify authorization using IdentityServer4. My IdentityServer sample project is taking the longest to update so I would expect at least one or two more posts on the process as each of the projects gets upgraded. 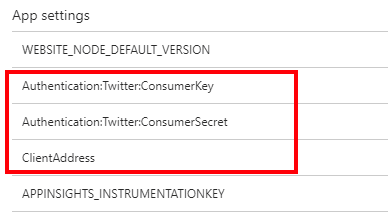 This post is going to cover adding authentication using Twitter to the same project that has been used in all of my IdentityServer examples. The same basic idea would apply to almost any third party authentication setup so this should give you a good starting point for any integration. The starting point of the code can be found here. 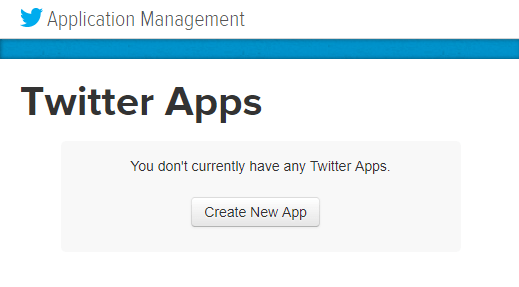 Before any code changes create a new application on Twitter via this page. Click Create New App to begin the process. On the Create an application page enter all the requested information. Note that the website won’t allow a localhost address. If you don’t have a real address for your application just enter a random URL as I did here. When finished click Create your Twitter application. Now that we have an application click on the Keys and Access Tokens tab. We will need both the Consumer Key and Consumer Secret when we get to the Identity Application. 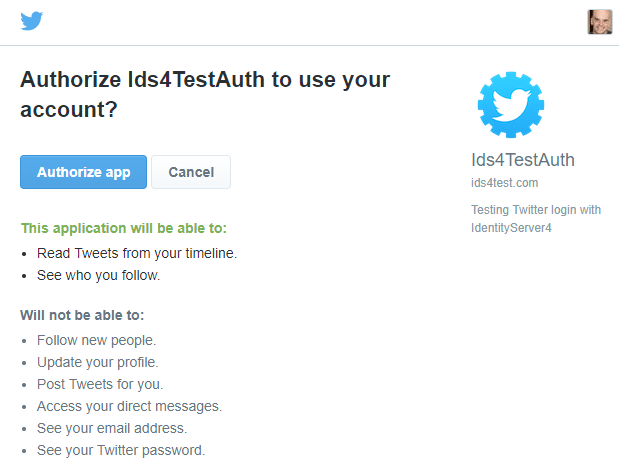 Now that we have a Twitter application ready to go let us dive into the changes needed to the Identity Application. The first step is to add a reference to Microsoft.AspNetCore.Authentication.Twitter via NuGet. Next in the ConfigureServices function of the Startup class after app.UseIdentityServer() add the following. The first three options should a straight forward enough. The next two are the values from the Twitter application I mentioned above. In this example, I am storing the values using User Secrets which get pulled out of configuration. For more details on how to set up secrets, you can see this post. The above are all the changes required. 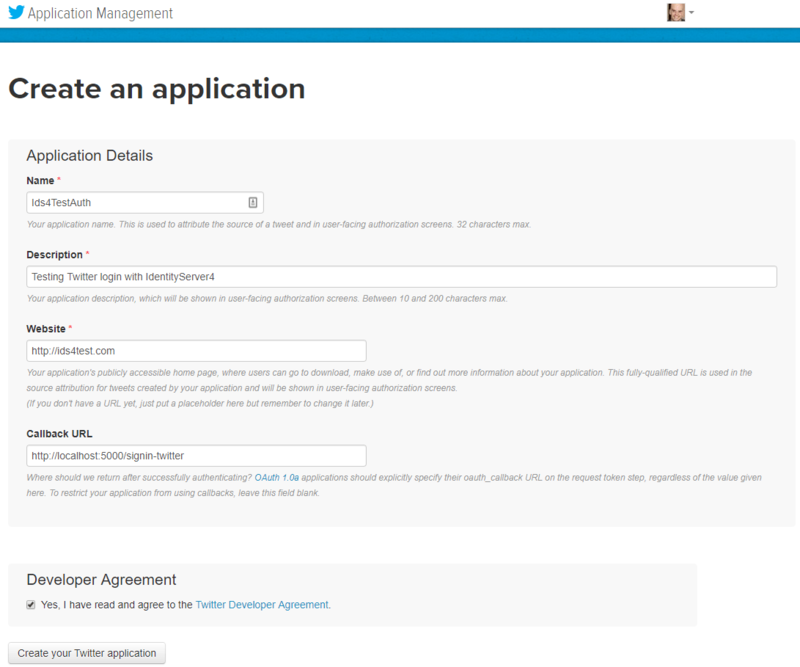 The Identity Application will now allow users to auth using Twitter. 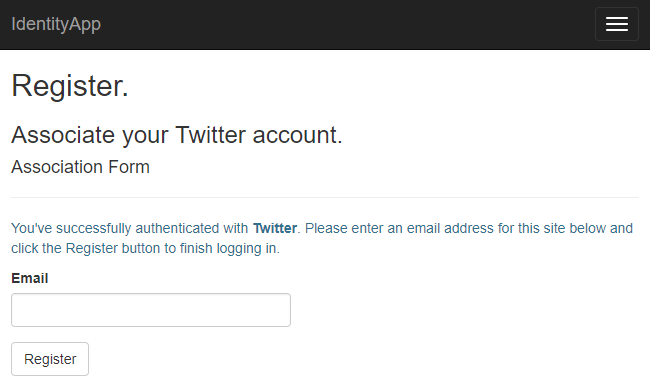 As you can see below the login page now has a button for Twitter. When the user chooses to log in using Twitter they are shown the following page where they must approve access to their Twitter account from your application. If this is the first time a user has logged in with Twitter they will be prompted to enter an email address to finish registration. As you can see adding external authentication is super simple. 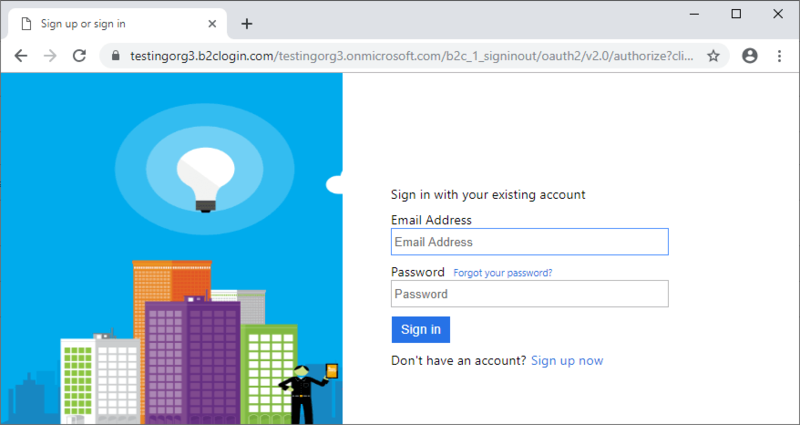 Check out the Microsoft Docs on Twitter Auth (ASP.NET Core 2.0 so look out for differences if you are not on the preview bits) and IdentityServer Docs on External Auth for more information. The finished code can be found here. Thanks to Andrew Stegmaier opening this issue on the repo that goes with my IdentityServer exploration I was made aware of a certified OpendID Connect client specifically written for Angular (4+). The angular-auth-oidc-client was created by damienbod. This post is going to cover the transition to this new client. The starting point of the code can be found here. All the changes discussed in this post take place in the ClientApp project. In package.json the following changes need to be made using your package manager of choice or manually changing the fill and doing a restore. Both app.module.client.ts and app.module.server.ts got a little cleanup to remove the duplicate provider code. The following lines were deleted from both files. The providers array moved to using providers imported from app.module.shared.ts. Next, in app.module.shared.ts the following imports were removed. Then, the following import for the OpenId Connect client was added. In the declarations array CallbackComponent was removed. In the imports array AuthModule.forRoot() was added. The route for CallbackComponent was removed and the canActivate condition was removed from the fetch-data route. Finally, the providers section is reduced to only the AuthService. That was a lot of changes, so I am including the full finished class below. The following files were completely removed. Some of them may come back in a different form, but for the moment the functions they were handling are being dealt with in a different way. The AuthService class was pretty much rewritten since it is at the core of the interaction with the OpenId Connect client. It still contains pretty much all the functionality as before just using the new client. The following is most of the class. I removed all of the HTTP calls except for get to save space. It doesn’t show the best in the world here so be sure and check it out on GitHub. All the IdentityServer configuration is done in the constructor using the OpenIDImplicitFlowConfiguration class. The NavMenuComponent class now needs some changes to match the new AuthService. First, the following change to the imports. 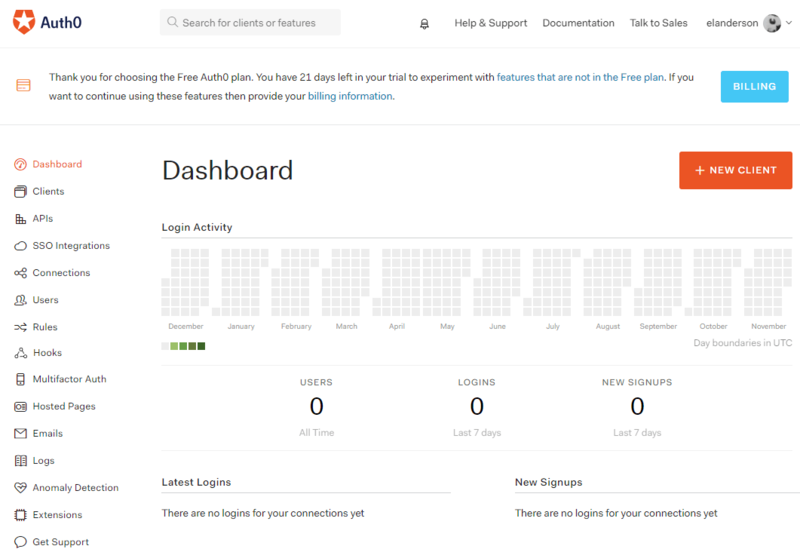 The AuthService class now provides the ability to subscribe to changes in the user’s authorization. To handle the subscription and unsubscription the class will implement both OnInit and OnDestroy. Here is the new class declaration. Next, here is the implementation of ngOnInit which handles the subscription to the change in isAuthorized. Then, ngOnDestroy handles the unsubscription. The class level variable for _loggedIn is replaced with the following two variables. The constructor has been greatly simplified and now only takes an instance of the AuthService. Finally, the login and logout functions have changed to match the new function names in the AuthService class. In the navmenu.component.html file, a couple of tweaks are required based on the new variable names used above. The first set is related to showing either Login or Logout. The final change in this file was to make the link to fetch-data only show if the user is logging instead of sending the user to an unauthorized view. The final changes for the conversion to the new client are in the fetchdata.component.ts and they are only needed because of a rename of the HTTP Get helper in the AuthService. This change took a lot of changes, but in the long run, it is going to be a better choice since the new client is focused on Angular. Another great thing about this client is they are looking into ways to handle the first load not remembering the user is logged in due to server side rendering (issue #36). The finished code for this post can be found here.